A year ago, I caught a low grade fever called Blood Orange Marmalade, mysterious because I don’t actually like marmalades. For months, food writers all seemed to be turning out batches of the stuff in lovely and addictive jewel tones that made my mouth water. Even so, when I found bags blood oranges in the grocery store, I hesitated because the result, good or bad, would be marmalade and, if you recall, I don’t actually like those. I decided to try it anyway when Marissa at Food In Jars posted a recipe for Small Batch Blood Orange Marmalade right where I could salivate over the pictures. They look friendlier in person. It wasn’t all glamor, though: when I made the recipe as straight as I could, the color was a beautiful ruby but the flavor was really, really sweet with only the mildest hint of orange, which is to say it tasted like cough syrup, only chewy. I decided that flavor was more important than color, so I added orange juice a cup at a time over a couple of days’ simmering time to improve the orange flavor, but I couldn’t overcome the intense sweetness. I was just about to give up and toss the whole batch when I stared into my fridge and found a possible solution: naranja agria or sour orange juice. About half a cup later, the bright orange flavor was exciting; to balance the additional liquid, I added one packet of liquid pectin. Deliciousness incarnate or chunky cough syrup? That’s for lovers of marmalade to decide. 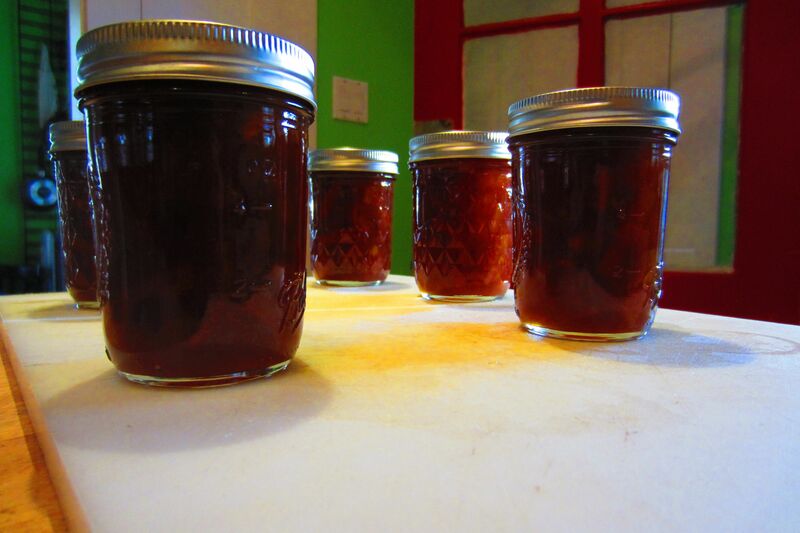 This entry was posted in compote something and tagged blood oranges, orange marmalade. Bookmark the permalink.